We love Mexican flavours – the exciting, vibrant heat popping with lime and chilli never fails. 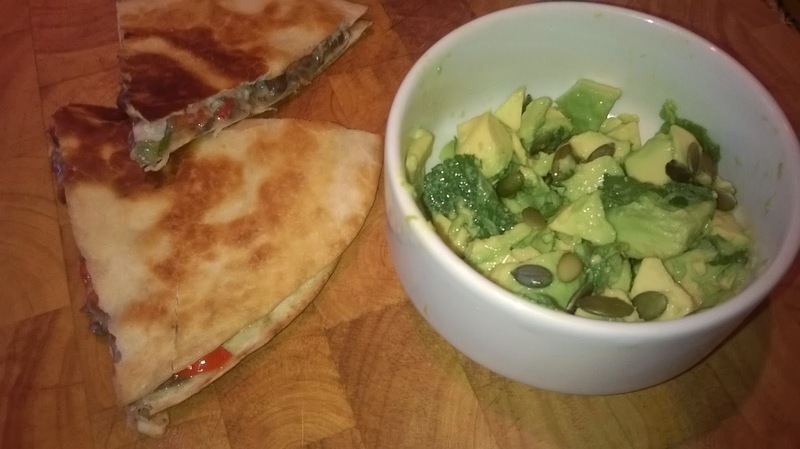 This recipe is another very quick and easy one (not counting the flipping of the quesadillas, which can be quite nerve racking…!) and makes a fantastic treat. It’s vegetarian, but the black beans are meaty enough to keep even the most demanding carnivores happy. Give it a go, and let me know how you get on! 1. Chop the red peppers and spring onions as small as you can, then put into a bowl with the black beans, cumin, oregano, chilli flakes and cheese. Get you hands in there and scrunch into a paste, making sure it’s all well combined and the beans are squashed. Season with salt and pepper. 2. Chop the avocadoes (simply run your knife around the avocado and pull apart, remove the stone and slice the flesh. The skin should peel away easily) and put into a bowl with the chopped mint, lime juice and pumpkin seeds. Use a fork to press and combine into a chunky mix. 3. Spread the black bean mixture over 2 of the tortillas. Place the other two tortillas on top, like sandwiches. 4. Heat the oil in a frying pan and cook the quesadillas one by one – for about 4 minutes on each side, until beautifully golden. Drain on kitchen paper when they have been cooked. 5. Slice and serve with the avocado salad on the side. Enjoy!